Hong Kong (Hong Kong SAR) – August 1, 2018 (travelindex.com) – Hotel Management Asia Summit (HMA), organized by one of the region’s premier conference producers Questex Hospitality Group, will be held on 27 Sep 2018. 120 senior hoteliers are scheduled to attend HMA to explore the ways forward for hotels in a competitive environment. Themed, “Exploring Innovation-Enabled Evolutions for Next Generation Guest Experiences and Service Flows,” HMS 2018 will once again provide the platform for the industry’s leading senior hoteliers to further exchange insights, discuss trends, and explore best practices to ensure continuous successes. While hoteliers in Hong Kong and Macau celebrate the tourism recovery, 2018 ushers in new hotel openings for both cities. Although the new hotels, and new brand presences, will inject some vibrancy into the markets, existing hotels will face challenges in room rates due to the increased supply. In additional, recent launched of various lifestyle hotels, poshtels, co-living spaces and extended-stay products have added to the competition. As such, hoteliers must innovate and reinvent, in order to drive financial results. From organizational structure to service flows, pricing to loyalty, recruitment to retention, hoteliers must review and modernize their business models. Only those who successfully deliver guest-centric services at outstanding value will outperform their competitors. HMA is a neutral one-stop strategy platform where Corporate CEOs/ Presidents, COOs and CFOs, VP operations Property GMs, Financial Controllers, Director of operations property owners, and managing directors will directly address all key management, operational, commercial, and financial challenges that impact corporate and property P&L. HMA Summit 2018 is part of the Hotel Management Asia summit Series, Asia’s only truly regional hotel management conference series. The series rotate through Bangkok, Hong Kong, Singapore, and Indonesia this year by leveraging regional experiences, insights, and innovations to address market-specific challenges. 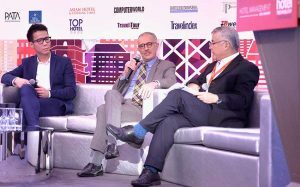 Watch our video highlights of 2017 Hotel Management Asia Summit here. The leading conference in Greater China that directly addresses all operational/management challenges, the Hotel Management Asia Summit provides a platform for hotel executives from both corporate level and property level to discuss key operational, branding and financial issues directly impacting corporate and property P&L. CEO, COO, CFO, VPs, GMs, Financial Controllers, and executive committee members will gather to strategize and debate on essential topics including brand equity, cash-flow management, cost control, innovation and staff retention and development. Industry leaders will share their best practices and recommendations with their peers.